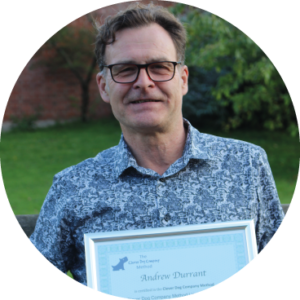 With over 30 years’ experience in dog training, Andrew has developed a truly in-depth knowledge on how to help owners train their dogs to their fullest potential. Specialising in friendly gundog and pet gundog training, puppies and home visit training, Andrew himself owns two Flat-coated Retrievers and four Spanish Waterdogs. It’s this passion for his own pets that has spurred him on to become chairman of the Inderbrook Dog Training Society. Enthusiastic and committed, Andrew loves helping people train their dogs and move them in the right direction, whilst also having a lot of fun in the process.